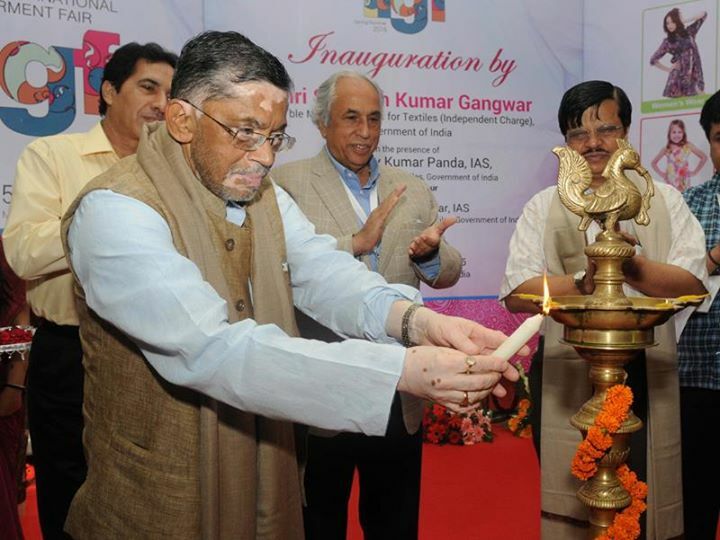 Shri Santosh Kumar Gangwar, the Hon’ble Minister of State for Textiles (I/C), inaugurated the 55th India International Garment Fair, 2015 in Pragati Maidan, New Delhi, today. Speaking on the occasion, the Minister said that given its employment and export intensity, the apparel industry plays a significant role in realizing the vision of ‘Make in India’. He said that under the leadership of Hon’ble Prime Minister Shri Narendra Modi, the Government has laid a renewed emphasis on boosting manufacturing, growing exports and generating more employment. Shri Gangwar cited the successful example of the textile industry of Gujarat and said that the Ministry of Textiles is working hard to take Indian textile industry to a higher level on the global stage. In this regard, the Minister mentioned about the landmark initiative announced by the Honourable Prime Minister Shri Narendra Modi in Nagaland, on 1st December, 2014, wherein an Apparel and Garment Making Centre shall be constructed in all North Eastern states. He added that foundation stone has already been laid for such centres in all states of the region, and that work has commenced. The Minister further added that people are interested in India and in working with India. 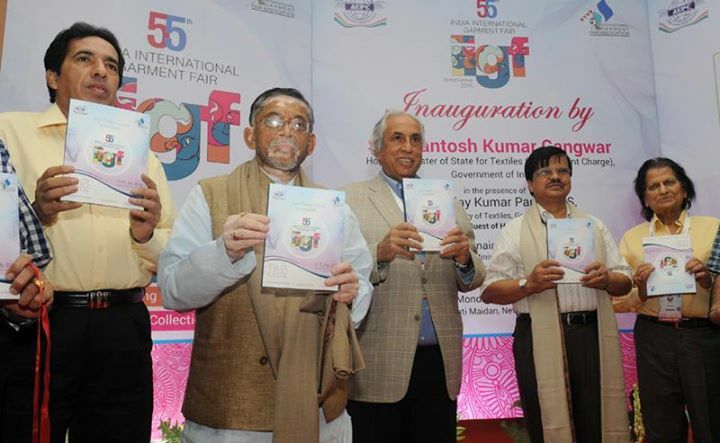 He observed that whenever he comes to the IIGF, he finds very good participation of exporters, with large number of reputed overseas buyers. He assured that Ministry of Textiles would continue to provide all requisite support for organizing India International Garment Fair. 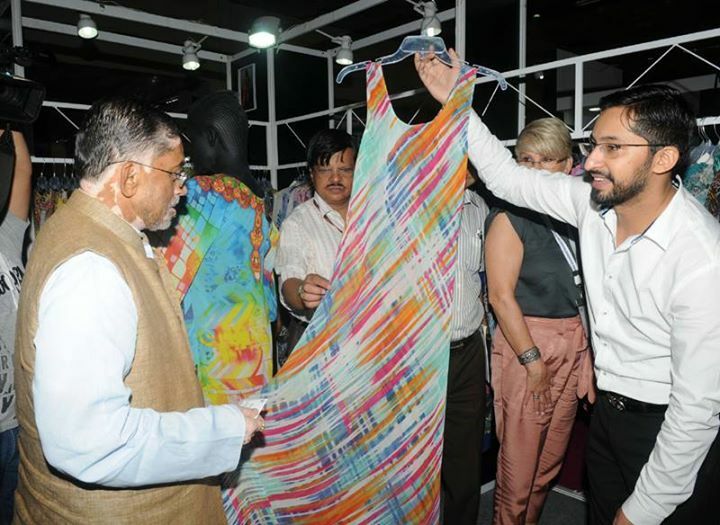 Shri Sanjay Kumar Panda, Secretary, Ministry of Textiles, stated that 55th India International Garment Fair is India’s largest garment show in South Asia, covering apparel and fashion accessories. He said that under the leadership of the Hon’ble Prime Minister, the Ministry has been laying a strong emphasis on skill, scale and speed, in order to improve production, exports and employment. He said that the apparel and garment industry has an important role to play in this. He requested all foreign buyers to take out some time to visit Incredible India, citing the Ministry’s efforts to link textiles with tourism. Shri Virender Uppal, Chairman AEPC stated that the 55th IIGF has attracted 305 buyers from across the globe, of which 202 are from traditional markets and 103 are from non-traditional markets. 2,921 buyers have already registered for the fair. He said that this is an indication that buyers have started showing faith and view India to be a safe and compliant destination for sourcing garments. The Chairman said that the objective of IIGF is to showcase latest and emerging trends in garments and fashion accessories. The Chairman thanked the Ministry of Textiles for its supportive policies. He said that India’s apparel exports in dollar terms for April-March of FY 2014-15 had increased by 12.3 per cent over the same period of previous FY and reached USD 16,846 million. He thanked the Ministry for accepting AEPC’s recommendations regarding improving ease of doing business. He added that RMG exports were to the tune of USD 1568.5 million in May 2015, an increase of 5.1 per cent against that of May 2014 which was 1492.4 million USD. India’s RMG exports for the period of April-May 2015-‘16 (cumulative) was to the tune of USD 3012.7 million, 7% higher than that of the same period previous year. Shri Sudhir Sekhri, Chairman EP, stated that the 55th IIGF is being organized by AEPC in association with AEMA, GEA and CMAI as partner associations and GEAR as co-organisers. Buyers from across the globe including EU, Asia, USA, Brazil, UK, USA, Turkey, Australia, Russia, Japan, UAE, Hong Kong and Spain are participating in the fair. The big buyers include One Jeanswear Group from USA, Grupo Hotelshops, Mexico, PJSC Melon Fashion Group from Russia, The Original Factory Shop from UK, Cortefiel from Spain, PNL from Thailand, Alona Miron Ltd from Israel, Options from Colombia, Aftershock from London, Lec Lee from Colombia, Group-Disco from Uruguay, Jeans West from Australia, Topitop from Peru, etc have confirmed their participation for the 55th IIGF. Shri Puneet Kumar, Secretary General, AEPC said that IIGF 2015 has witnessed the largest participation of buyers so far. He said that despite some relative advantages enjoyed by India’s neighbouring countries in the export market, the apparel and garment sector of India is making steady in-roads into foreign markets due to its inherent strengths of design, creativity and innovation. He expressed the hope that the FTA with European Union gets concluded at an early date, thereby giving a boost to the sector. The event has exhibitors from across the length and breadth of India, including Rajasthan, Tamil Nadu, Maharashtra, West Bengal, Uttar Pradesh, Gujarat, Madhya Pradesh, Karnataka, Orissa, Haryana, Delhi and Punjab. There are more than 400 exhibitors who would be putting up their best collections and latest fashion products for display at the 55th IIGF. Executive Committee Members of AEPC, Presidents of various Associations along with senior officials of Ministries, dignitaries from embassies and esteemed buyers hailing from across the world were also present at the inaugural function. 55th IIGF is a three day fair which is being held from 13th to 15th July 2015, at Pragati Maidan, New Delhi. The Government of India launched Tourist Visa on Arrival (TVoA) enabled by Electronic Travel Authorization (ETA), presently known as e-Tourist Visa scheme, on 27th November 2014 for 43 countries. The Government extended this Scheme to the citizens of Guyana and Sri Lanka in January, 2015 and April, 2015 respectively. The e-Tourist Visa facility was further extended to the nationals of 31 countries in June, 2015. (i) During the month of June, 2015 a total of 15,557 tourists arrived on e-Tourist Visa as compared to 2,112 during the month of June, 2014 registering a growth of 636.6%. (ii) During January-June, 2015 a total of 1,26,214 tourists arrived on e-Tourist Visa as compared to 11,953 during January-June, 2014 registering a growth of 955.9% . (iii) This high growth may be attributed to introduction of e-Tourist Visa for 76 countries as against coverage of earlier TVoA scheme for 12 countries. USA (41.71%), Australia (9.67%), Germany (7.21%), Canada (4.86%), Republic of Korea (4.29%), France (3.38%), Singapore (2.73%), UAE (2.70%), Russian Federation (2.53%) and Mexico (2.47%). New Delhi (43.11%), Mumbai (22.27%), Bengaluru (11.70%), Chennai (9.83%), Hyderabad (4.85%), Kochi (3.83%), Kolkata (2.89%), Trivandrum (1.14%) and Goa (0.38%). Minister of Urban Development and Housing and Urban Poverty Alleviation Shri M.Venkaiah Naidu today directed the two urban ministries to step up efforts to promote use of Hindi in official work as per the norms stipulated under the Official Language Policy. Progress in this regard in respect of the two ministries was reviewed at a meeting of the Hindi Salahkar Samiti here today. Shri Naidu shared the concerns voiced by the members of the Committee over shortfall in meeting the norms for use of Hindi as Official Language. He directed the top administrative brass of both the Ministries to step up efforts to promote use of Hindi by December this year before the same is reviewed by the Committee in the next meeting. Shri Venkaiah Naidu observed that “after extensive deliberations, the makers of the Constitution declared Hindi, the largest spoken language in the country as the Official Language and its implementation can’t be taken as a ritual. This needs to be implemented with all the seriousness. The initial resistance in some parts of the country has come to be replaced by ever increasing number of people speaking Hindi. Use of Hindi along with English needs to be promoted in the functioning of the central government while that of local language should be encouraged by the State Governments”. Shri Venkaiah Naidu further said that four Prime Ministers of the Country including late Shri Morarji Desai, Shri Deve Gowda, Shri P.V.Narasimha Rao and Shri Narendra Modi came from non-Hindi speaking states and all of them were good in Hindi and this is a significant development in many ways. He said that Shri Modi has been using Hindi to converse with world leaders and at all international forums. Shri Naidu referred to leaders of several developed countries like Japan, France, Germany etc., likewise using their mother tongue and those countries prospering without resorting to English as a medium of learning. “Language gives primary identity to a community and a Nation and hence, various regional languages and Hindi shall be protected and promoted” said Shri Naidu. He said that simple and easily understandable words should be used instead of less known literary words for promoting the use of Hindi. Members of Hindi Salahkar Samiti of the two urban ministries appreciated Shri Naidu for acquiring reasonable proficiency in Hindi and for extensively using Hindi in Parliamentary debates and discussions and on other occasions. In his response, Shri Naidu said that he realized the importance of Hindi and learned the same after shifting to national politics in late 80s. Shri Venkaiah Naidu assured the members of the Committee that he will ensure that the past ritualistic approach towards use of Hindi in official work of the two ministries will be replaced by a more serious and purposeful actions. The meeting was attended by Shri K.C.Tyagi, MP, Shri Mahesh Chandra Gupta, Dr.(Smt) Anita Arya, Shri Vibhuti Narayan Singh, Shri Sanjiv Dubey, Shri Dilip Bhai Pandya, Secretaries and other senior officials of the two urban ministries and heads of various attached and autonomous organisations. Union Minister of State for Water Resources, River Development and Ganga Rejuvenation Prof. Sanwar Lal Jat has asked States with sufficient water resources to appreciate the national need for Inter-Linking of Rivers (ILR) with a spirit of good will and co-operation. Chairing the 5th meeting of the Special Committee for inter-linking of Rivers held in New Delhi today he said this mega project will go a long way in enhancing water and food security of the country. Updating the members with the latest status of various ILR projects, Prof. Jat said the various clearances related to environment, wildlife and forest etc. for Ken-Betwa link project are in the advance stage of processing. He said “I hope with all statutory clearance available, we will be able to start the actual execution of work on the project by the end of this year. The Government will be implementing this national project as model link project of ILR programme”. The Minister said the work for preparation of DPR of Par-Tapi-Narmada link project is in concluding stage and it is expected to be completed by this month end. He said after completion of DPR of Par-Tapi-Narmada link project the issue of water sharing between Gujarat and Maharashtra in respect of Damanganga-Pinjal and Par-Tapi-Narmada link project will be addressed. Referring to an important decision taken by his Ministry regarding the appraisal of inter-linking projects the Minister informed that henceforth Central Water Commission (CWC) will simultaneously convey its comments to National Water Development Agency (NWDA) along with the State Governments. NWDA will directly submit the compliance of comment to CWC. The simplified procedure will expedite the appraisal of link-projects. On Mahanadi-Godavari link project the Minister informed the members that senior officials of his Ministry made a presentation before the Chief Minister of Odisha on May 29, 2015 on alternative proposal of Mahanadi-Godavari link. He said 17 members of Parliament have expressed their support to this project. On Sapt-Kosi project the Union Minister said the investigation and preparation of DPR of Nepal part of this project is being expedited. The Sapt-Kosi dam will facilitate the Kosi-Ghagra link, which apart from irrigation will provide huge flood control benefit to Bihar. The Minister said that his Ministry would soon be taking up the planning of a very important link, Manas-Sankosh-Teesta-Ganga in consultation with the Governments of Assam, West-Bengal and Bihar. This link project will not only provide large irrigation and water supply benefits to Assam, West-Bengal and Bihar, but will also make available large quantum of water for transfer subsequently to southern States. Water Resources/Irrigation Ministers from Tamil Nadu, Gujarat, Rajasthan, Jharkhand, UP, Maharashtra and AP also participated in the deliberations and gave valuable suggestions. Some of them were of the view that ILR should be implemented within a definite time frame. The Vice chairman of NITI Aayog, Arvind Panagariya has said that states wishing to facilitate industrialization can further benefit from liberal land leasing if they simultaneously liberalize the use of agricultural land for non-agricultural purposes. He shared the views with the people in his blog post published on the website of NITI Aayog in New Delhi today. The full text of the blog post is as follows and can also be accessed at www.niti.gov.in. “ Land leasing laws relating to rural agricultural land in Indian states were overwhelmingly enacted during decades immediately following the independence. At the time, the abolition of Zamindari and redistribution of land to the tiller were the highest policy priorities. Top leadership of the day saw tenancy and sub-tenancy as integral to the feudal land arrangements that India had inherited from the British. Therefore, tenancy reform laws that various states adopted sought to not only transfer ownership rights to the tenant but also either prohibited or heavily discouraged leasing and sub-leasing of land. Many large states including Telangana, Bihar, Karnataka, Madhya Pradesh and Uttar Pradesh ban land leasing with exceptions granted to landowners among widows, minors, disabled and defence personnel. Kerala has for long banned tenancy, permitting only recently self-help groups to lease land. Some states including Punjab, Haryana, Gujarat, Maharashtra and Assam do not ban leasing but the tenant acquires a right to purchase the leased land from the owner after a specified period of tenancy. This provision too has the effect of making tenancy agreements oral, leaving the tenant vulnerable. Only the states of Andhra Pradesh, Tamil Nadu, Rajasthan and West Bengal have liberal tenancy laws with the last one limiting tenancy to sharecroppers. A large number of states among them Rajasthan and Tamil Nadu, which otherwise have liberal tenancy laws, do not recognize sharecroppers as tenants.